Some people on your holiday shopping list may be impossible to shop for, but at least one group is a breeze: superhero fans. With curiosity and enthusiasm for this subgenre at an all-time high, there’s never a shortage of worthwhile gift ideas. If anything, the list is simply too long. To help you sort through the possibilities, we’ve narrowed the options down to five convenient categories. There are many more where these came from, but this is a good place to start your superhero search. Whether you’re shopping for DVDs, Blu-rays, or 4K Ultra HD discs, the only challenge is knowing what your friends and family already own. All of 2018’s biggest superhero blockbusters—including Black Panther, Avengers: Infinity War, Incredibles 2, Deadpool 2, Ant-Man and the Wasp, and Venom (which arrives in stores on December 18)—are available. For a blast from the past, you could also consider the 4K release of the original X-Men trilogy, which finally arrived in stores on September 25. In 2018 it’s easy to forget that all this superhero stuff started with the written word, but for the bookworm on your superhero shopping list there’s an abundance of worthwhile new reading options. You can go behind the scenes for a closer look at a recent blockbuster (Marvel’s Avengers: Infinity War–The Art of the Movie) or the MCU’s complete history (Marvel Studios: The First Ten Years). But if you’re shopping for a really dedicated reader, particularly one who doesn’t want to break the illusion, consider Marvel Studios: The First Ten Years Anniversary Collection, the 12-volume, 2,496-page novel series that re-tells the MCU’s complete history. There’s a range of superhero options available for gamers of all kinds this holiday season, including the anxiously awaited new Spider-Man PlayStation 4 game, which arrived in September. While the most devoted gamers already have their copy you can always invest in the Digital Deluxe Edition, which offers three worthwhile expansions. For those who prefer a more analog gaming experience, there are at least two essential superhero Monopoly games that should be on your shopping list: USAopoly Thanos Rising and the Deadpool Collector’s Edition. It may be slightly excessive to give Lego its own category, but that company has gone out of its way to keep superhero fans satisfied. For those shopping on a stocking stuffer budget, your best bet is to purchase one of the minifigures of various Marvel characters, including Vision and Scarlet Witch. More ambitious and/or patient assemblers will appreciate Thanos: Ultimate Battle, the 674-piece Lego Marvel Super Heroes set that gives you a chance to assemble an eight-inch model of the Guardians of the Galaxy’s ship—and much more. Also of interest from Lego is the Hulkbuster Smash-Up, which includes an opening minifigure cockpit, wheel-operated “bashing arm function,” and posable fingers/arms/legs, not to mention some more modestly scaled figures of Gamora, Iron Man, and Star-Lord. Like everything else superhero-related, figures come in many shapes and sizes. In addition to the aforementioned figures and minifigures from Lego, there’s a range of options from Funko Pop! 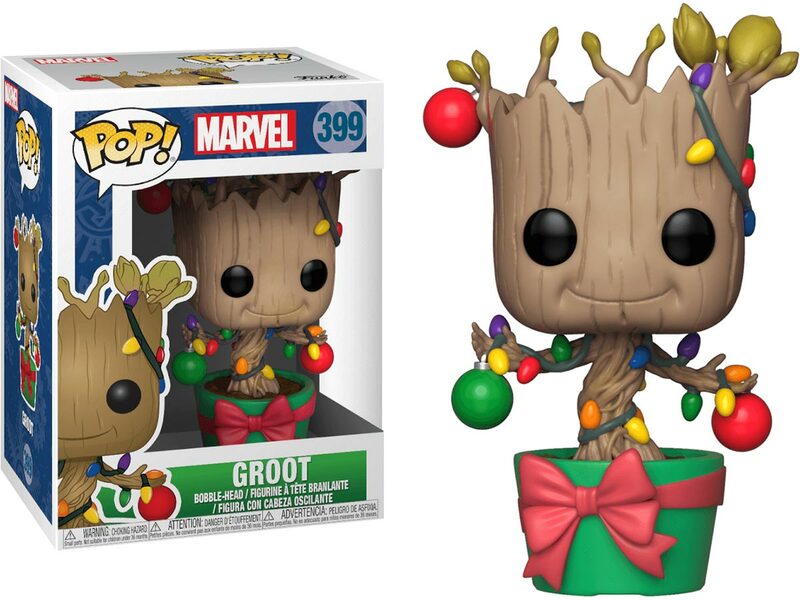 including the seasonally appropriate Groot Holiday Bobble-Head. More exorbitant spenders—particularly those catering to DC enthusiasts—may want to consider the Jim Lee Trinity statues, which feature the precision of design you’d expect from Lee—and an extremely steep price tag. A three-pack (featuring Batman, Superman, and Wonder Woman) will cost you over $200, but if you’re looking for approval from the superhero fan in your life this purchase guarantees success.